One of the first steps in the roofing process is to determine if you have a steep-sloped roof (typical of residential homes) or a low-sloped/flat roof (typical of commercial buildings). 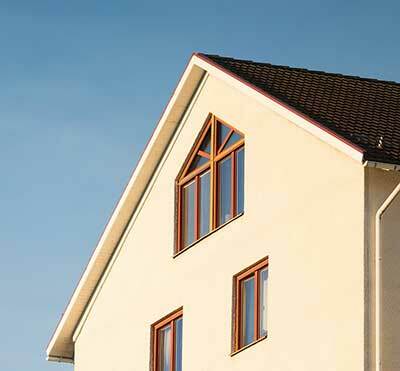 The type of roof you have will determine what kind of materials are used. The slope of your roof is also known as the pitch, and it is expressed as a ratio of the rise (height) to the run (length) of the rafters. For example, if you measure the height of your rafters to be 4 feet and the length to be 12 feet, the pitch of your roof is 4:12. Roofing materials are based on pitch ranges. Note that residential roofing generally refers to steep-sloped roof repair and commercial refers to low-sloped or flat roof repair, but these can be interchangeable. Steep-sloped: Designed to shed water rapidly with no standing water and are individually fastened. Low-sloped/Flat: Designed to withstand the slow drainage of water without developing leaks. Generally consists of rolled roofing membranes or sheets that are attached to a roof by means of tar, asphalt, glue, heat welding, etc. and have seams that are completely sealed.